Vitamin B12 is the only “mandatory” supplement that vegans need to take. Because of where humans get B12 naturally, vegans don’t tend to get much (if any) from whole food sources. People in general get most of their B12 from animal products. The good news is that your body can store a lot of it. Depending on your size, you can store between 2,000 and 4,000 micrograms (mcg) in your body, mainly in the liver. Yes, that’s only 2-4 grams, which doesn’t sound like a lot, but the recommended daily allowance (RDA) of vitamin B12 is 2.4 mcg. In theory, if your vitamin B12 stores were full before going vegan, you could be fine for something like 3-6 years. The problem is that you don’t know how full your stores are. In addition, having too much vitamin B12 isn’t a bad thing, but not having enough can cause serious health issues. So while you don’t need to start supplementing right away, it’s not a bad idea to pick one up at some point. Here’s a list of the best vegan vitamin B12 supplements (some supplements are not vegan). Can I Survive Without a B12 Supplement? What happens when you deplete your stores? 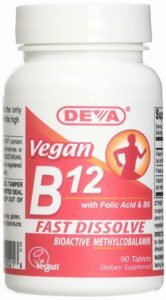 While supplements are one option, another option is to get B12 from vegan food sources. If you eat a lot of these, you may be fine without a supplement. But in that case, you’d want to have regular blood tests to check your B12 levels and make sure they are healthy. Personally, I prefer to also take a supplement, just to be on the safe side. This is something you should discuss with your doctor, as B12 deficiency can cause very serious health issues.